What a preposterous world we live in, where developments in invisibility cloak tech are common enough to elicit yawns. Fine, you unmovable automatons, how about a time cloak? Is that something you might be interested in? 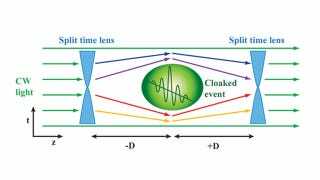 Researchers at Cornell have designed, built and demonstrated the first "cloak" that hides events in time. The process relies on similar methods of distorting electromagnetic fields as invisibility cloaks, but it exploits a time-space duality in electromagnetic theory: diffraction and dispersion of light in space are mathematically equivalent. Scientists have used this theory to create a "time-lens [that] can, for example, magnify or compress in time."